I’ve been plugging away on a plain vanilla sock - no pattern - for what seems like eons now but which is in actual fact just a few weeks. It’s lovely yarn, a hand dyed sock yarn blank. Dyed to create lovely speckles and splashes of colour as you knit, but if it weren’t for a few strategically placed stitch markers I would feel as though I were making no progress at all. A recent pair of stripy socks though positively flew off the needles. So much so that I swear house elves have been coming in at night in a scenario reminiscent of the Elves and the Shoemaker fairytale. The magic promise of “just one more colour” combined with a few Netflix watching sessions - DH and I are currently addicted to The Last Kingdom - meant that a few times in the morning I picked up my knitting only to be genuinely surprised at how much I had done the previous night. I don’t know about the laws of space and time but it seems to me that stripy socks occupy a time dimension all of their very own. 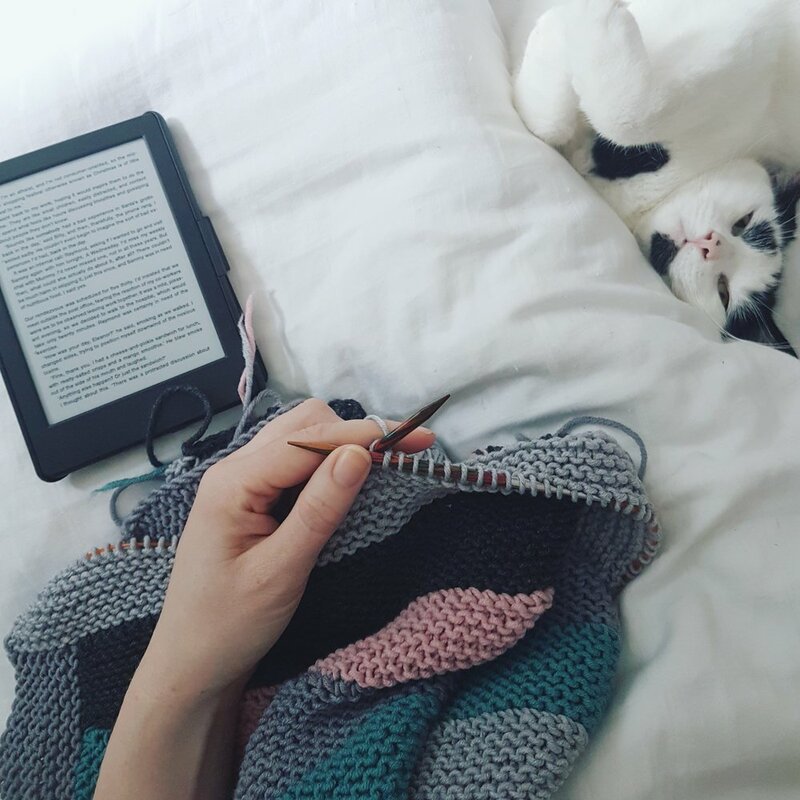 I post a lot of photos of my knitting, often with my Kindle alongside as that’s my favourite way to spend a bit of down time, and I’m frequently asked how I manage to knit and read at the same time. I think it’s important to say up front that this isn't something that I do all the time and I’m certainly not some sort of multi-tasking guru. Only certain kinds of knitting is appropriate for this and only at certain times. But yes, with that caveat in place I believe it is perfectly possible with a little practice to teach yourself to knit without looking at your yarn. Your eyes are then free to watch TV, go to the cinema or indeed to read. I don't know about you but my reading time really suffered when I took up knitting and I really needed to find a way to bring it back into my daily life. It really is a habit and we often look at our stitches just because they are there. We don’t really need to see what we are doing as we are relying on touch and muscle memory to do most of the work for us. A lot of the time I watch my stitches just because it is soothing and slightly hypnotic and because who doesn’t like to see pretty colours. Pick something simple - preferably all stocking stitch or garter stitch. Something like a sock or a hat knit in the round is perfect, especially if you are using a circular needle. Start to knit and for a stitch or two try closing your eyes or glancing away from your work. Use a Kindle, e-reader or a book that will stay open by itself. Put the book on a flat surface in front of you. Just take it slowly, don’t rush the stitches and have patience with yourself. Don’t try to do any complicated cabling just yet or to read War and Peace. Just pick some lovely smooth yarn (something that doesn't split) and a good, relaxing read. Have a go - just a few minutes every day - and you might just surprise yourself. 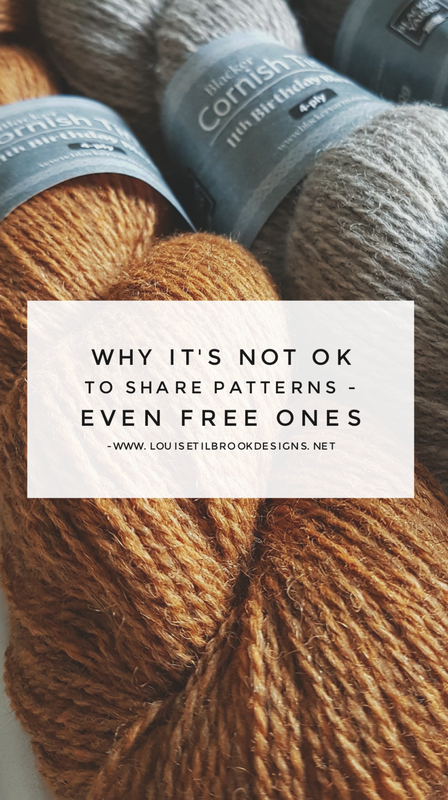 One of the most common misconceptions that I come up against in my daily online chat is the enduring myth that it is OK to share patterns as long as they are free. Most people understand and accept the copyright issues around paid patterns but for free ones it seems that it is still very much fair game. As a designer who makes a significant chunk of her income from online pattern sales I do still make a few of my patterns available for free and I choose to do this for a number of reasons. I have a baby cardigan pattern which I use for class teachings - the Fuss Free Baby cardigan - and I also make it available free via my Ravelry store. On there I ask that if people use and enjoy the pattern that they consider making a donation to Bliss (a UK charity for newborn and premature babies) which is a subject very dear to my heart. For every copy of this pattern that is given to a friend, or photocopied or shared (or photocopied and sold on Ebay - yes, that really does happen), that is a lost opportunity for a hard working charity to receive a donation. Sometimes I will make a pattern available free for a limited time in order to achieve a specific marketing goal. Apologies if that sounds cold and calculating but at the end of the day we designers are trying to earn some form of living from this. As an example the Fuss Free Festival Shawls was available as a free download for a time in order to encourage people to sign up to my newsletter. I was very clear that this was for a limited time and that after the promotion had ended it would revert back to being a paid pattern. Once the shawl was for sale though I still had a bit of battle with folks who thought it was fine to email copies of it to their friends on the grounds that they “got it for free and so it was only fair to give it to others”. Sometimes a pattern is free, just because I want to offer it for free. But I would still like people to download it from Ravelry, favourite it, talk about it and generally help to spread the work to other people who haven't come across my designs yet. All of these things help to boost a designers visibility online and can really help to make a difference to the success or not of future pattern sales. A photocopied sheet or emailed screenshot really doesn’t achieve the same results and in the crowded online space of pattern sales all those little bits of exposure really do add up. Nothing boosts a designers profile more than lots of happy knitters chatting online or in person about your latest fun pattern. And to those knitters who already do go above and beyond to support and promote the work of indie designers - a heartfelt and very woolly thank you. Your enthusiasm makes everything we do worthwhile. 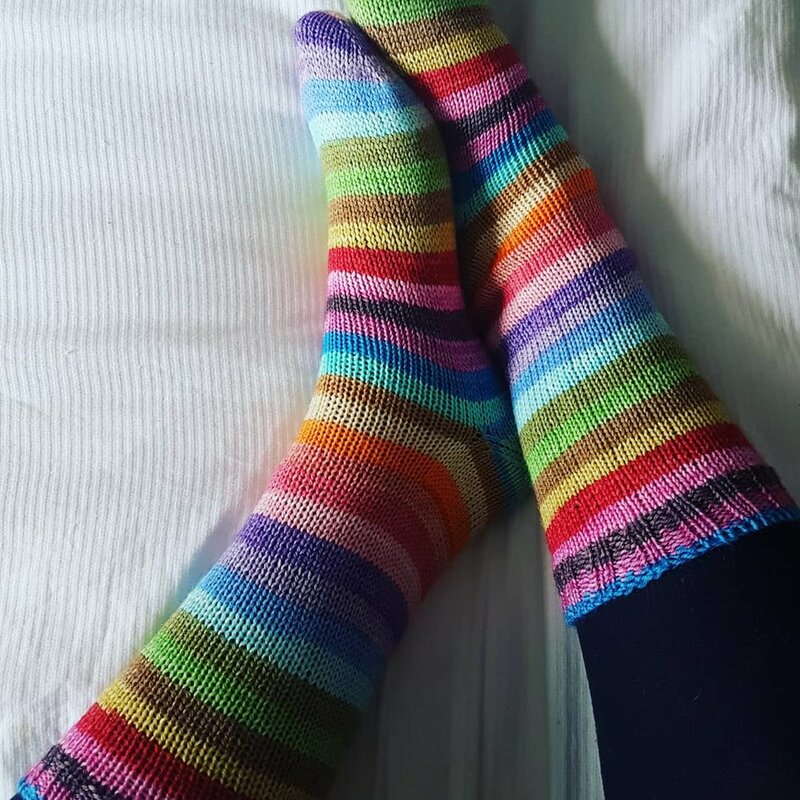 If you’ve seen any of my Instagram photos recently you will be under no doubt that I have recently become a tiny bit obsessed with scrappy socks - using up odds and ends of scrap sock yarn to create delightfully odd and mismatching stripy socks. We all have those tiny bits of sock yarn lying around - too small to be made into a mitered square on the memory blanket (each of my blanket squares needs about 3g) but too much to bear to throw away - and these are the perfect project to make use of them. Thrifty and colourful - talk about a win win! 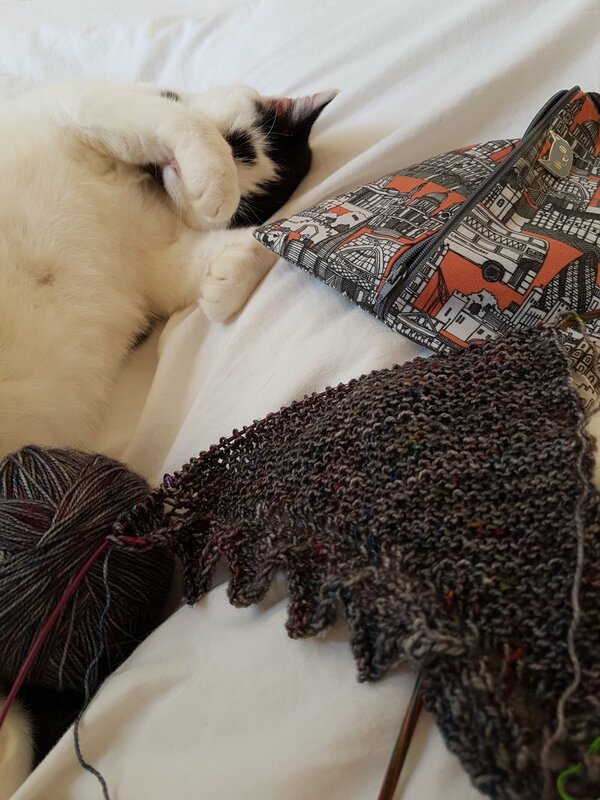 If I’m totally honest though the one thing that has put me off scrappy socks in the past has been the words feared and dreaded by all knitters - “Weaving in the Ends”. But, after my friend Tash recommended a life changing new technique to me I have become a total and utter convert to the world of scrappy socks. The Clasped Weft Join achieves the Holy Grail of the knitting world- being simple to work, super quick and requiring absolutely no end manipulation. Just a quick snip and away you go with the next colour. I originally learnt the technique by watching the YouTube tutorial filmed by Boston Jen and I highly recommend taking a look - it’s super quick and you’ll have the method down pat after just a few practices. This makes it the ideal project for when you are travelling or out and about. Just grab a few tiny scraps of yarn (more for a long journey) and a pair of scissors or travel snips and you are good to go. I’ve knit one sock already and am already well underway with the next. Unusually me for I’m not trying to match them and I can say with some surprise that it really is quite unexpectedly freeing. I am drawing from the same batch of colours and each stripe is 7 rows deep but these are my only ‘self-imposed’ rules. It's really quite addictive, just to be able to reach into my little bag, grab a new colour, quickly join and away you go. I can predict many more of these colourful, fun socks in my future now. In the face of the relentless encroachment of online shopping and the large commercial companies all using their considerable resources to vie for our attention, it’s easy to feel powerless in the face of it all. So much is made of the convenience of online shopping, the speed and the price that it's easy to just shrug your shoulders and go with the flow. But even the snazziest of websites, with all their glossy photos and shiny banners can’t hope to compete with the sensory overload that is a yarn shop. As knitters and crafters we are tactile creatures. Never more at home than when using our senses to see, touch, smell and even listen to yarn. Don’t laugh - don't tell me you don’t love the pleasing crunch that a rustic tweedy yarn makes when you squish it between your fingers? Such is the effect of a yarn shop that many knitters will simply stop on crossing over the threshold and take a moment just to look around and let their senses acclimatise to the dazzling array of colours and textures on offer. Now tell me the last time that buying from a website made you feel like that. Did your heart skip a beat as you opened up the web page. Did you pause to appreciate the joy as you clicked the checkout button? I very much doubt it. It’s important to note that I make an exception in this to online shopping with indie dyers such as Countess Ablaze and Eden Cottage Yarns. Both of these yarns I rarely get to meet in person so online shopping really is the next best thing to plonking myself down in their studios for a cup of tea and a yarn squish. As well as the sense of community that a yarn shop can foster - the classes, the expertise and help available, the knitting groups and just the sheer joy of being around like minded people and it’s clear that buying yarn online is a very poor relation. Now I know there are times when it just isn’t possible to buy yarn in an LYS. Not every town has one for a start or it may not stock what you need. Difficulties with transport, with access and choice can all play a part and leave you reaching for the mouse instead. But when you do, as we all do from time to time please bear in mind that you have a choice over where you spend your hard earned money. Unlike with book buying online (where Amazon has pretty much annihilated the competition) the same isnt true - yet - of yarn shopping. You could chose to click on one of those well known online yarn giants whose well placed Google Ads fall so conveniently at the top of the search screens. Or you could choose to scroll a little and shop online from one of the many UK LYSs who have fabulous websites and offer a great alterative online shopping experience. After all, it may not be a yarn shop local to you but it is still local to someone else. And even if the small independent yarn shop is solely online (as opposed to being a bricks and mortar shop) your money will still go into the local economy where that small business is based. Just as convenient - you can still shop for yarn at 10pm in your PJs. Just as easy - modern websites and payment systems means that even the smallest of LYS can invest in a slick purchasing system and in a few clicks that yarn can be on it’s way to you. The difference is that you will have the peace of mind that knowing you have supported a real person, a real small (often family run) business. A real LYS that doesn't have the advertising budget to compete with the “big box” stores but which still very much has a valuable service to offer. So, as it was Yarn Shop Day on May 12th, wouldn’t it be nice if we didn’t need a special day to remind us. What if every day was an LYS Day - where we make a conscious choice to support our LYSs - even if they are miles away from where we live. 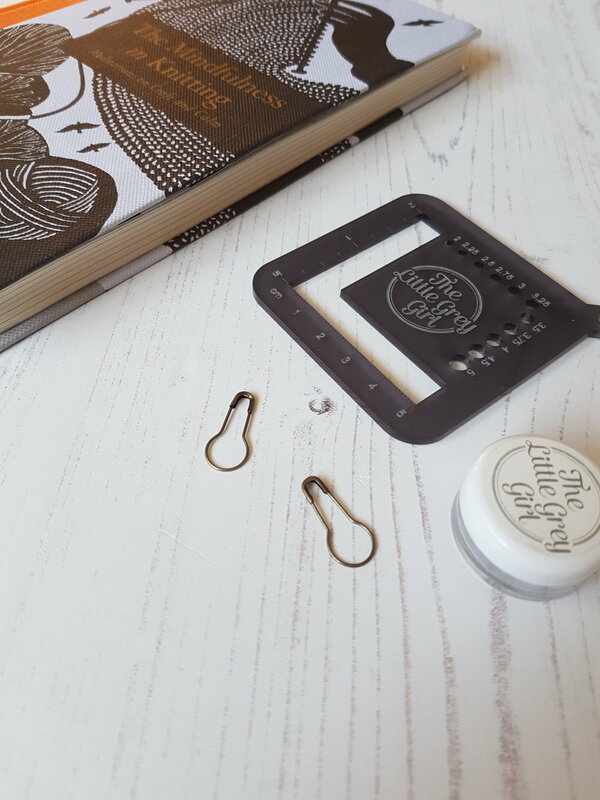 You may have noticed from some of my social media posts that I have a not-so-secret fondness for those little bulb pins - sometimes called interlocking or removable stitch markers. I’ve managed to acquire quite the collection over the years - either bought in bulk from Merchant and Mills, bought in pretty colours as sets and also squirrelled away from the labels of clothes bought in slightly posh clothing stores. The reason for my obsession? 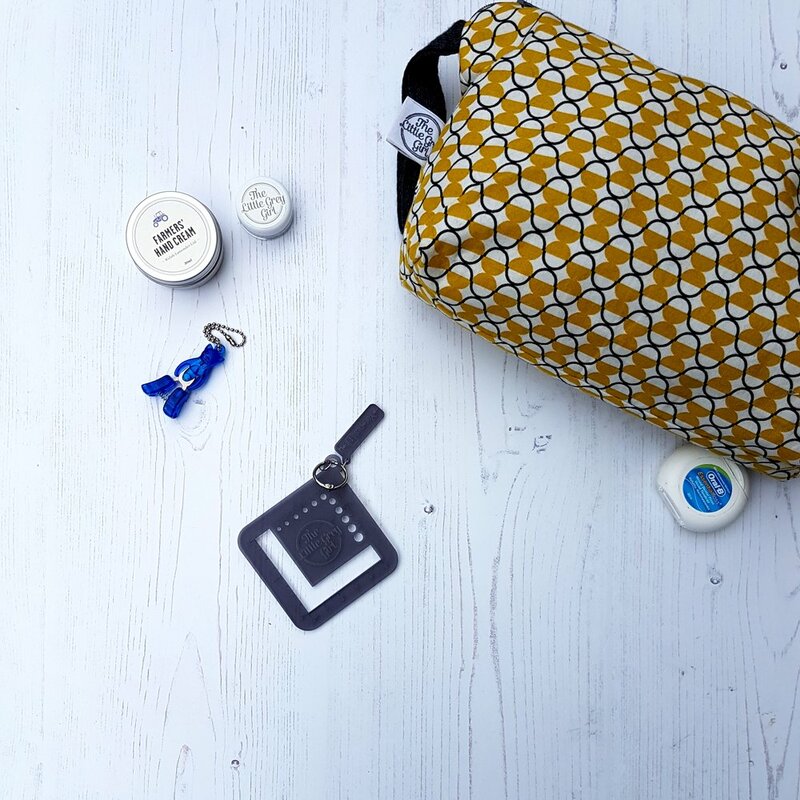 They are the most ridiculously useful items you’ll ever possess in your knitting bag. So much so that I’ve started to clip a few through the zipper of all my project bags - just so that I’ll never be without one. So what do I use them for you may ask? Marking stitches during a long cast on: slip one onto the needles after every 50 stitches or so to save lots of counting. 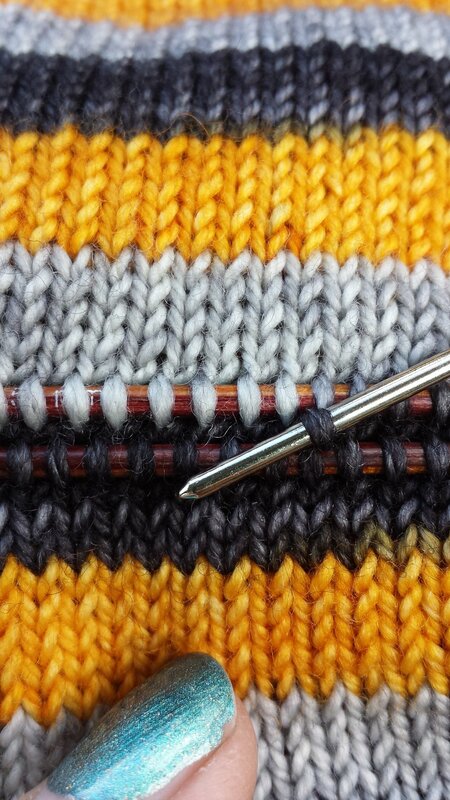 Marking the right side when working in garter stitch. 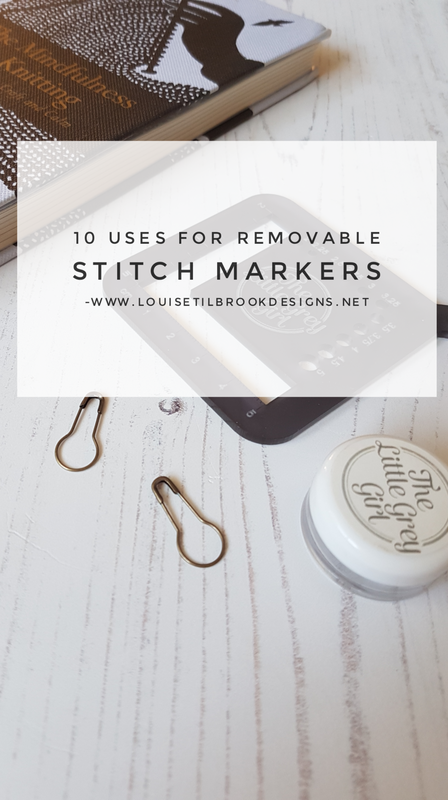 Use as a regular stitch marker. Catching up a dropped stitch to fix later. Marking sleeve decreases/increases - to save counting - especially on darker fabrics. Marking rows knitted - put one in every day rows to save counting. Holding knitted pieces together during seaming. Holding a few solid stitch markers safe and together in your knitting bag. Pinning a reminder note to your knitting: if you are setting it down for a while and you want to remind yourself of something**. Marking a central double decrease - or similar decrease where the stitch marker has to go through the actual stitch. ** I am well aware that this is something of an aspirational goal. Very few of us set a project aside fully intending to not pick it up again for the next six months, but if you were that sort of person who plans ahead with military precision then this would be the perfect way to not forget which size needle tips you used. If you have any other uses for them I’d love to know - they are endlessly adaptable - just like knitters after all! It’s no secret that I am a dedicated (some would say, obsessive) knitter and there really are very few social situations outside of a church where I don’t feel comfortable in whipping out my needles. In order to be able to sustain this dedication it is necessary to have a range of suitable knitting projects on hand at any given moment - at least that’s my excuse for having so many projects on the go at once. But it really does make sense if you stop to think about it. This is for me why I could never be a monogamous knitter. As much as I admire the patience and tenacity of these dedicated knitters, what on earth would you do when faced with a 3hr train journey at short notice and all you have to hand is the final border on a king-sized blanket. Just the thought of undertaking a journey on public transport with No Knitting is enough to bring me out in a cold sense of dread and fear. Anyone who has ever travelled by train in the UK and has experienced the horrors of the unscheduled “rail replacement bus service” will know exactly what I mean. No, as far as I’m concerned, amassing multiple WIPs is nothing at all to do with a willful disregard for the “one project at a time” brigade. It’s not about gleeful, profligate casting on either. More, it’s about making sure that you have a project ready for the time slot you have available to you. Have 20 minutes to wait in the doctors surgery for an appointment? Fine - grab that baby cardigan and work a few rounds on the sleeve. Have a blissful hour to yourself on the sofa with Netflix and coffee? Perfect time to pick up stitches on that sweater neckband or add a square or two to your sock yarn blanket. Leaving for an impromptu cinema visit with 10 minutes notice? Not a problem - just grab that plain vanilla sock toe that you cast on weeks ago. Do you see what I mean? Yes, you might not be churning out the finished objects as fast as our monogamous knitterly friends but you will always have an appropriate knitting project on hand. Which to my mind is far more important and infinitely more pleasing. And for the truly dedicated knitter you might want to employ my time honoured tactic of putting together the “Emergency Knitting Bag”. No laughing at the back there - the Fear is real. I have a couple of projects bags squirreled away each holding a skein of sock yarn - either pre-wound or a commercial ball and a set of DPNs. I know I don’t normally use DPNs but in an emergency I’m prepared to compromise and I have loads of sets lying around that I rarely use. I keep one in my craft area - ready to grab and another in the boot of my car. Truly - you never know when you might need it. My car boot holds bottled water, dried fruit, emergency first aid kit - and sock yarn! And after a recent escapade in the Lake District involving a large piece of sharp metal and the front tyre of my husbands car, I’ve also taken the opportunity to stash a bag in his boot too! Never mind the Scouts - it truly is the knitters who are always well prepared. From left: Worth the Fuss shawl, Fuss Free Festival shawl, KISS shawl. After what seems like the longest winter ever, I am thrilled to see that here in the UK it does finally seem as though Spring has arrived. We actually have some warm sunshine today which is so very welcome after what feels like weeks of mist, fog and grey gloom. Of course, as is always the way, it's also the day that the kids go back to school after the Easter break - c'est la vie. I don't know about you but spring always makes me think of shawls. They make for such great layering and transition pieces. With our ever changeable weather here in the UK it can be a guessing game trying to decide what to wear each day and a scarf or light shawl can provide a perfect layer of additional warmth and then then be tucked into your bag as the day warms up. Providing warmth without the commitment (and potential heat exhaustion prospects ) of a full on knitted sweater. I'm always amazed when I hear of knitters who have never knitted or shawl or who "don't get them". There still remains a perception that shawls are for "old ladies" and for many people the word shawl conjures up images of a large, woollen triangular affair, possibly with a fringe. Wrapped around the shoulders of dear, sweet, grey-haired old lady. In fact, one glance at the work of Stephen West for example should be enough to dispel this myth forever. Bright, colourful, and exuberant. His designs are the antithesis of the traditional image and like anything in knitting are infinitely adaptable to fit your own wardrobe and aesthetic. So for the next few weeks I'm going to be celebrating my love of shawls in all their wondrous variety. 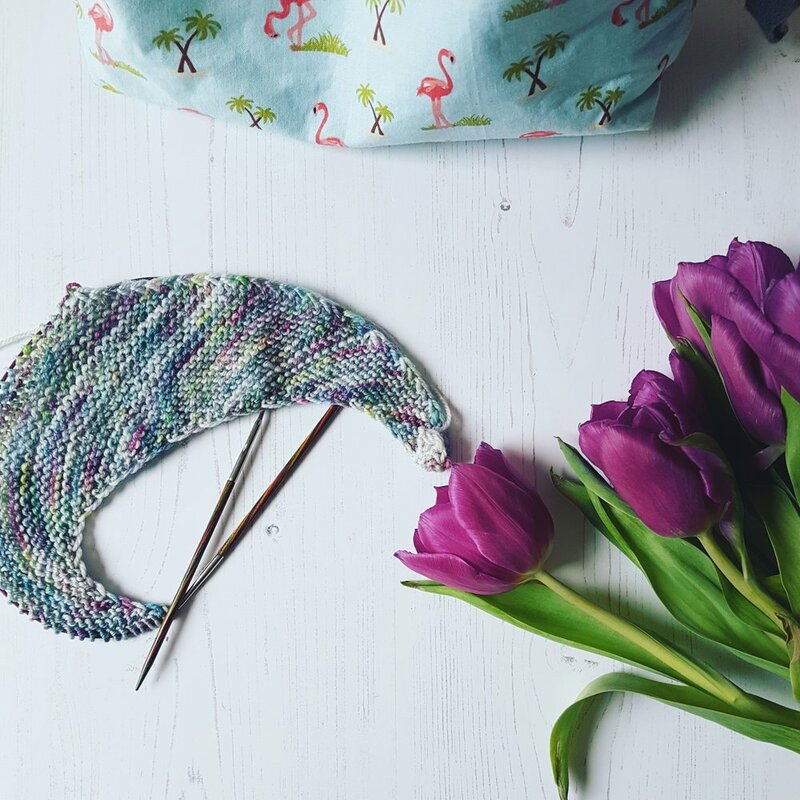 I'm going to be looking at shawl shapes, different construction methods and also some all important styling tips on how to wear your beautiful creations. If you have a shawl related question or something you have always struggled with please do let me know. Just leave a comment below or pop over to the Facebook Group join in the discussion there. And just to celebrate the arrival of my favourite (if fickle) season, I've set up a discount code in my Ravelry store. 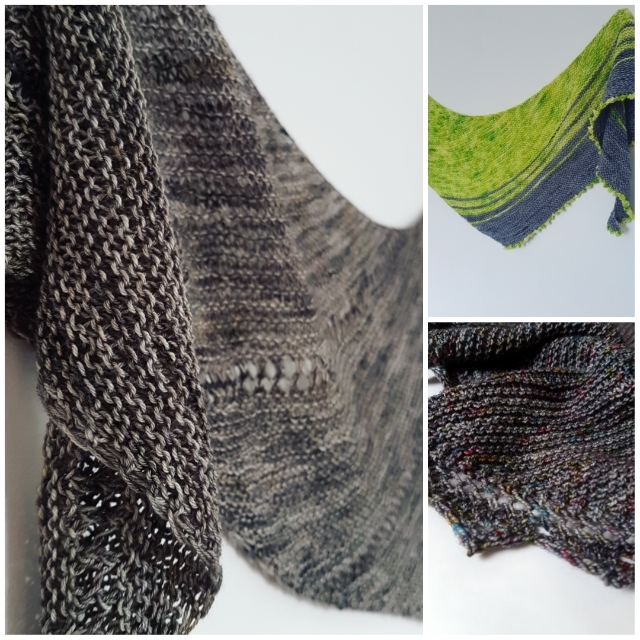 Just use code SPRING for 25% off the price of 3 of my most popular shawl designs: Worth the Fuss, Fuss Free Festival Shawl and the KISS shawl. In the meantime I couldn't leave you without a message from the man himself. If you haven't seen this before please make sure you aren't watching on public transport in case of accidental guffaws. He is priceless and his attitude to shawl wearing is something I think we can all aspire to. Yarn is Manos del Uruguay, Allegria. Colouway Orchid. After wrangling a new sock yarn purchase for most of the afternoon and battling pooling in it's various guises my yarn and I sat down to have a full and frank exchange of views. After a glass of wine we decided that actually it didn't want to be socks, that it had never wanted to be socks and that I was cruel and heartless for trying to persuade it into a nice, simple plain vanilla sock. So, I took the yarn's advice and cast on for a nice garter stitch Fuss Free Festival Shawl instead. And now everyone is happy. The moral of the story is clear - sometimes you just have to let the yarn win. And also - a glass of wine helps most (but not all) knitting dramas. When the going gets tough - the tough cast on for a new project. In fact, to be more specific they cast on for a colourwork sweater. Don't get me wrong, I am a huge fan of a soothing garter stitch project but sometimes you experience challenges in your daily life. The kind of stuff that can really send your brain into a tizzy. The kind of stuff that, if you are prone to overthinking, like me, has your brain spinning with endless "what-if's" or "if only's" - you know the kind of things I mean. At times like this for me garter stitch just doesn't cut it. I need to direct all that brain energy into something more focussed, something to keep it occupied and stop me from going round and around in ever decreasing circles. And recently for me, that meant casting on for a colourwork sweater. I've had the Laine magazine No3 in my hot little hands for a while now, poring over the glorious patterns. Really I want to knit them all but realistically that will have to wait. But a colourwork yoked sweater has been high on my list for some time and Treysta with it's patterned yoke and simple clean lines fitted the bill perfectly. Luckily I had vast amounts of West Yorkshire Spinners Aire Valley aran yarn which matched the gauge I needed (I originally bought it for a sweater for DH which didn't work out) and I was easily able to supplement the dark grey with a few balls of contrasting yarn from Isla of Brit Yarn. After that it was just a simple of matter of casting on and going for it. Because I had been unwell I had the perfect excuse to sit in bed (doting husband and kids in attendance) and just knit. And I have to say that it was sheer heaven. With a snoozing cat at my feet, a supply of snacks courtesy of the aforementioned kids and no distractions my brain welcomed the opportunity to focus on something positive and constructive. I would never have thought that I could knit an entire colourwork yoke in a little over 24 hours - but apparently I can given the right circumstances - and an unlimited supply of biscuits. Who knew? You know me, I can never resist a challenge. Especially when it comes with a cast iron excuse to sit on the sofa and watch lots of sporting action. The Ravellenics - held on Ravelry are a great excuse for that and for weeks now I've been plotting and planning the perfect combination of projects. Of course, as knitters we should know that real life never runs that smoothly and I suddenly found myself needing a new travel project a short notice. I have just released my newest shawl design - the KISS shawl - which is a stocking stitch shawl knitted from side to side with a lace border worked as you knit. All the time I was knitting it though the recuring thought running through my head was "I bet this would look really cool in garter stitch". Most things look better in garter stitch in my opinion. So, this was the perfect project to pick. I know the pattern anyway so there was none of the awkward set up phase. I could just cast on and knit. Now, just to spice things up a little I am going to Unravel this Saturday and so the next thought that popped into my head was "Wouldn't it be cool to be able to wear this to the festival?" So, here we are. 5 days to go and 350m yarn to knit. Totally doable I know - I just need to focus and not get distracted. If you see me browsing the Ravelry queues or surfing Instagram feel free to prod me and get me back on track. It's a beautiful sunny day, crisp and clear and the perfect day for a new pattern release. The KISS shawl lives up to its acronym of Keep It Simple Stupid as it is super simple to knit. Starting and ending with just 2 stitches there's no complicated cast on nor do you have to bind off a billion stitches. The lace border is knit on as you go, so at the end you can just bind off and wear it with pride. It's perfect for the special skein of sock yarn that you have squirreled away somewhere and because it is knit side to side you can really maximise the yarn you have. Just weigh the yarn periodically and once you have used half you start the decreases. It really is that simple. The sample here is knit in the fabulous Nether Alderley 4ply yarn from Yarns from the Plain - a beautiful yarn which drapes really well when knit at a relaxed gauge. 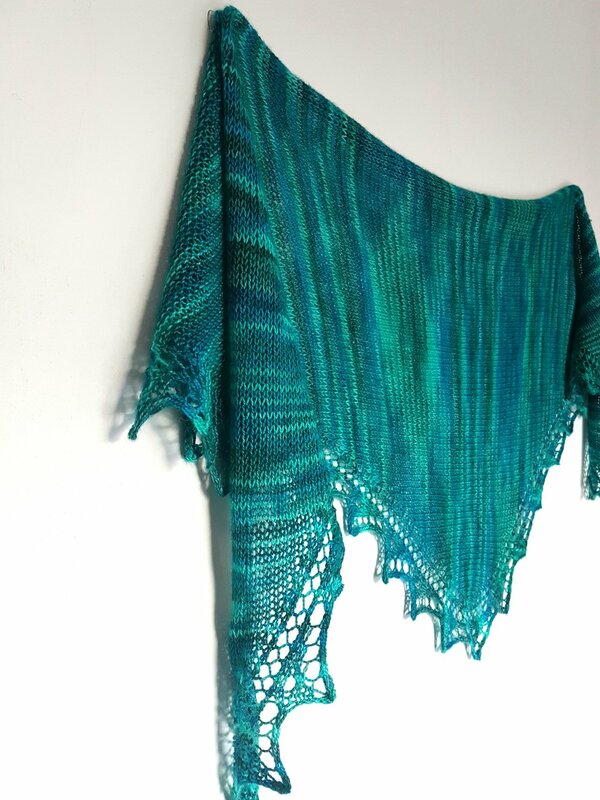 The body of the shawl is worked in stocking stitch which really shows off a hand dyed yarn. But if your yarn has speckles or pops of colour it would look equally fabulous with the body knit in garter stitch instead. Or you could knit two version - one of each and see which you prefer. You can find the pattern here - and there is an early bird discount too (until midnight Feb 9th) - if you are a newsletter subscriber though do check your inboxes as you have something a little special. Either way, there's no better way to celebrate the coming of spring (allegedly) than with a new shawl.